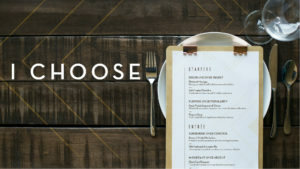 In our “I Choose” series, Pastor Paul guides us through life’s different choices. In the fifth message Pastor Paul talks about our choices of how we divvy up our time. In the fourth message Pastor Paul talks about discipline over regret. In the third message Pastor Paul talks about surrender over control. In the second message Pastor Abel talks about purpose over popularity. In the first message Pastor Paul discusses the result of our choices.